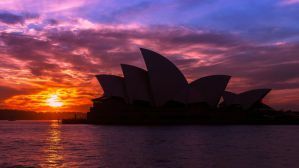 Australia has long been a backpackers haven, with most visitors beginning or ending their trip in Sydney. There is no shortage of great hostels throughout the city, and it's not hard to meet other visitors who are just beginning their trip and looking for fellow travel companions. Many hostels host social events including barbecues or pub crawls so that guests can easily get to know each other. If you're a first time backpacker, you'll love the atmosphere, as it creates an environment where it's easy to meet others. Whether you're traveling alone, with friends, or as a couple, hostels offer a great setting to interact with a diverse group of people. A great hostel for solo travellers, female travellers, couples, or small groups. If you're looking for the quintessential backpackers experience, then Bounce Sydney is one of your best options. It's a top rated hostel in the city and regularly gets the best reviews by guests. It has a friendly environment and it won't be long before you make a few friends here. This hostel is located in Surry Hills where it is very close to some of the most trendy bars and restaurants in Sydney. It's close to the famous Crown Street area and its a great place to experience Sydney's local culture. The rooms are new and modern. You can choose between double or triple private rooms, or four, six, seven, or eight bed dorms. Both co-ed and female only rooms are available. All guests have access to high speed wi-fi service, air conditioning, lockers, a roof top terrace, private bathrooms (in private rooms), and cable television in the lounge area. There are also plasma televisions in the private rooms. There's an on site bar and restaurant and refrigerators available to guests. The hostel is a social setting and offers guests daily activities such as themed events or barbecues. It's the perfect place to meet other travelers. A great hostel for solo travellers, female travellers, couples, and small groups. This hostel is located in an impressive heritage listed building just across from Central Station. This is right in the middle of the backpacker precinct in Sydney. It offers guests all kinds of amenities including a rooftop pool, a sauna, and a relaxing outdoor area. There are two full kitchens available to guests, and a large dining area, lounge areas, laundry facilities, cinema, a pool table, meeting rooms, a cafe, a small shop, and a bar. This hostel is famous for hosting excellent events for its guests. These include pub crawls, sporting events, tours, movie nights and of course, barbecues. This is a great place for travelers who want a social environment that is not a party hostel. It's a great place for first time travelers or seasoned travelers alike. If you want to meet people and hang out in a comfortable and social setting, then this is the place for you. There are double private rooms and four, six, or eight bed dorms available. Female only, male only, and co-ed dorms are all available. A great hostel for solo travellers, groups of friends, and couples. Wake Up! Sydney Central is one of the most popular hostels in Sydney. It's conveniently located near Paddy's Market and Chinatown and is just a short walk from the Darling Harbour. If you're looking for a friendly crowd who are eager to meet other travelers, then this is the place to stay. The staff are wonderful and will go out of their way to help you with anything that you might need. They also host regularly parties and events for guests, so it's really easy to get involved and get to know everyone. Every night there seems to be something going on. If you're looking for a fun crowd who wants to party, then this is the place to stay. There's also an attached bar that has regular drink specials, live music, and a great vibe. You can order some simple and cheap meals there as well. The hostel has both private rooms and dorms available. There are twin and double private rooms for those who want a little more privacy. There are four, six, eight, and ten bed dorms as well. Both female only and co-ed rooms are available. A great hostel for solo travellers, temale travellers, and groups of friends. Kings Cross Backpackers is another popular youth hostel in Sydney. It's great place to stay for backpackers who want a social setting in a convenient location. It's very close to the famous nightlife of Kings Cross, but it's still set back a bit so it is relatively quiet. There are plenty of amenities available for guests including a large lounge, a full kitchen and dining area, and a large television with many dvds that you can choose from. There's also a roof top deck with a barbecue and nice views. The hostel staff are friendly and helpful, and there are regular events to help guests get to know each other. Whether you're traveling alone or with a group of friends this is a fun and friendly place to stay. The hostel does not have any private rooms. There are dorms that sleep four, six, eight or ten people. There are also four bed female only rooms available. All other rooms are co-ed.